You don’t have to be a skilled chef to learn how to fillet a fish but you do need the right knife. So, what is the best fish fillet knife? We’re glad you asked! we researched some of the best-selling, top-rated products and put together this review to help you find the right one for you. Before we move into our top picks, let’s take a look at some of the important features to keep in mind while you shop. Type: There are both manual and electric knives that are great at filleting. There are good things about each. Manual takes a little more finesse and skill while electric knives have a lot of power to get through bone. Length: These knives ranch in length from 6 to 8 inches. That’s the perfect size for this kind of knife. Any smaller and they wouldn’t work as well, any larger and they’d be too big to maintain good control. Flexible Blade: A flexible blade is a nice thing to have, especially with a manual knife. Flexibility varies from knife to knife. Some don’t have very much flex at all so you’ll be able to find just what you’re looking for. Handle Material: Most of these knives have handles that are made out of different kinds of plastic but you’ll find some rubber and even wood grips, too. Each has a different look so choose the one that fits your needs. No-slip Handle: No-slip handles are particularly important if you’re planning to use this knife on a boat or camping trip. Filleting fish can get messy and being able to hold onto your knife helps you stay safe and get better results. Warranty: All but one of these knives are covered with a warranty. Some are only for a year or 2 but a lot of them come with limited lifetime warranties. Make sure you know what’s covered and what isn’t. Now that you know the key features to look for, let’s move into our top ten reviews. Here’s how it works. We put our top and budget pick right at the top of the list. This way they’re easy to find, even if you’re in a hurry. All of our picks are awesome and we found a nice variety so stick around if you can. You never know which one will be the right one for you. Alright, let’s get started! If you’re looking for the best fish fillet knife, check out our top pick, the Victorinox Pro Boning Knife. Victorinox has been making expertly crafted chef’s knives in Switzerland since 1884. Their knives are lauded by professionals and they really live up to the hype. This knife has a flexible curved blade made of stainless steel and does an amazing job at making thin filets. The Fibrox handle is ergonomically designed for a great grip that fits any hand. It’s comfortable and designed to give you a lot of control. That’s not all, it’s also slip-resistant so you won’t lose your grip even if your hands get wet and messy. Another great thing about this knife is it’s hygienic and completely dishwasher safe. It also comes with a lifetime warranty. Our budget pick is this Japanese fish fillet knife from Mercer Culinary. Despite being ridiculously affordable, it really has a lot to off. The high-carbon, Japanese steel blade is easy to maintain and sharpens to a razor sharp edge. It won’t rust, corrode, or discolor and has a stiff flexibility that’s great with larger pieces of meat. The handle is pretty impressive, too. The ergonomic design is actually made of 2 different materials that work together to make it both comfortable and durable. The textured grip allows for a safe, non-slip hold on the knife and gives the user a lot of control. Plus, for added protection, there’s also a finger guard. The manufacturer recommends hand washing to protect the longevity of the knife and to make sure the limited lifetime guarantee still applies. Another option for best fish fillet knife for the money is the Morakniv Fillet Knife. The blade is sharp, lightweight and flexible, perfect for filleting small to medium-size fish. It’s made of Sandvik 12C27 stainless steel that’s known for being tough, hard, and corrosion resistant. The high-friction handle has a textured grip plus it’s non-porous so it won’t absorb odors or bacteria. This knife also comes with a heavy-duty plastic sheath that you can wear on your belt or clipped on. It’s a great choice for long fishing or camping trips when you want something close at hand to prepare you lastest catch for dinner. That’s not all, the slots in the sheath allow the knife to dry even when you’ve put it away. 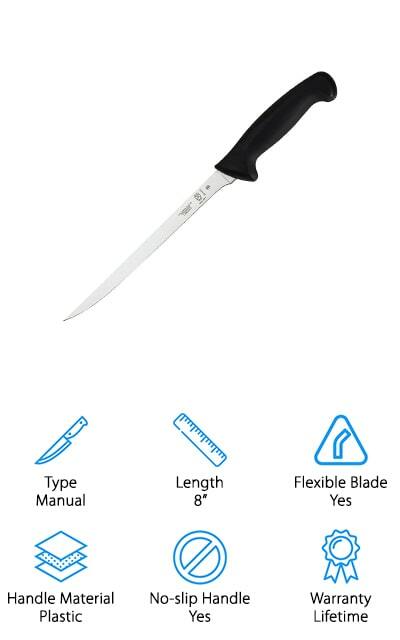 This knife also comes with a lifetime guarantee. The Kershaw Clearwater Fillet Knife is a good fish fillet knife that gives you a lot of knife for not a lot of money and it even comes with a lifetime guarantee. The 7-inch flexible blade is perfect for medium to large fish, including eel, tuna, cod, catfish, and salmon. It’s made of Japanese stainless steel that’s hard, sharp, and resistant to corrosion. The handle is made of soft rubber copolymer that’s textured for a safe and steady grip. Plus, it’s black with bright orange accents so it’s always easy to spot. While this is a great knife to use in the kitchen, it’s great in other places, too. Because it comes with a sheath, it’s a great tool to take along on a fishing trip, either on your belt or in your tackle box. Our pick for best electric fish fillet knife is this product from Rapala. 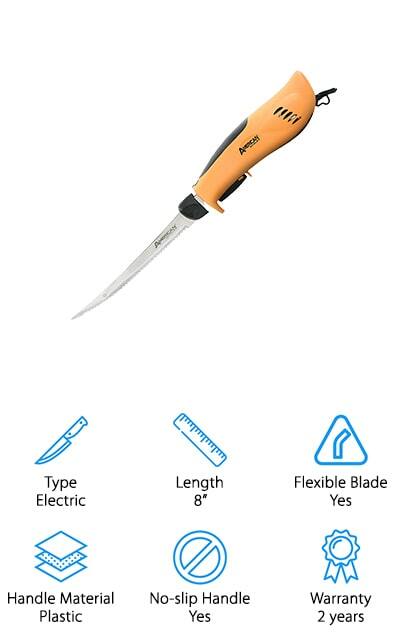 It’s twice the speed and 3 times the power of a standard fillet knife. The heavy-duty motor delivers 100V of power while the custom air flow system dampens vibrations and helps keep the motor cool. The comfortable grip eliminates fatigue and helps you move the knife smoothly and easily. Plus, the 8-foot power cord provides more than enough room to work in just about any space. This knife is so powerful, it really does all the work. You just have to guide it along. A dishwasher safe reciprocating-style blade is included that’s just the right size for most filleting needs. It really has the power to help you can tackle rib bones, backbones, and larger fish, no problem. Buck Knives has been in business since 1902 and this Folding Fillet Knife really shows you why they've been around for so long. The long, 6.5-inch blade actually folds inside the handle to nearly half its size. That makes this the perfect knife to keep in your tackle box so it’s handy when you need it. That’s not all, it also has a lanyard loop so you can carry it with you anywhere. The blade is thin and flexible, ideal for cutting through backbone easily while still maintaining control. It’s made of titanium covered steel and is really easy to hone to a razor sharp edge. The handle has a rubber coating with grooves for a no-slip grip and a stainless steel safety guard that protects your fingers, just in case. 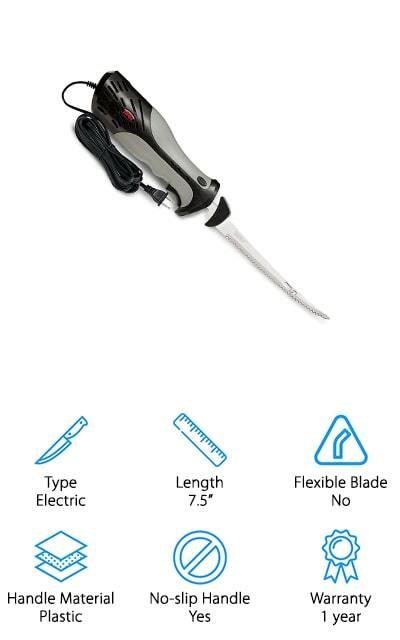 Another high quality fish fillet knife is the American Angler Electric Fillet Knife. This electric knife has a pretty impressive motor so it can easily rip through bone while still being able to delicately fillet a trout. It also has an 8-foot long power cord that provides ample room to work without the cord getting in your way. It's built with a special airflow design that helps keep the engine cool for longer cutting periods and also saves on wear and tear. 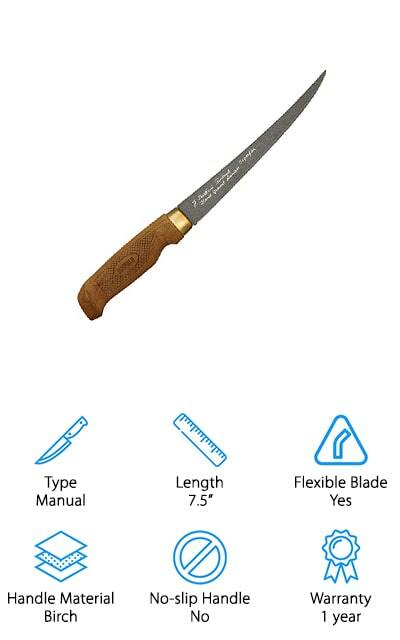 In fact, American Angler claims it has 4 times the lifespan of comparable knives. It includes a set of 8-inch freshwater blades but there are actually a few different blades available that all work with the same base. Basically, with the right attachments, this knife can do just about anything. Next up is this Rada Cutlery Fillet Knife. 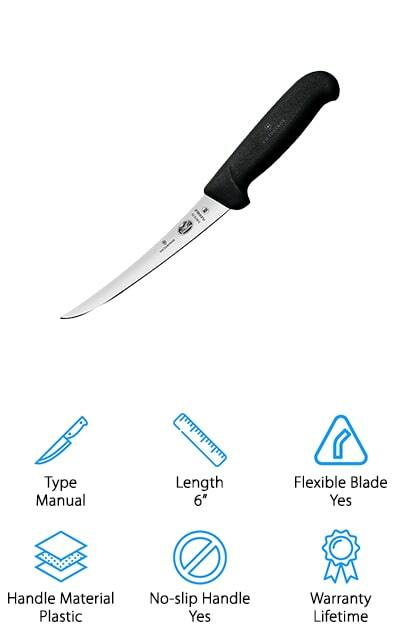 It’s large, flexible blade is made of surgical grade, high carbon steel and is perfect for your kitchen or tackle box. 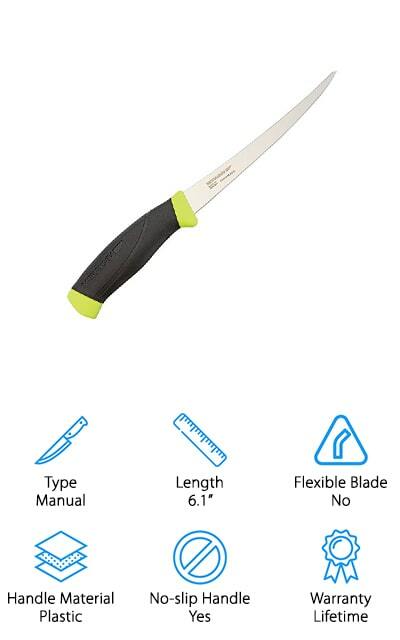 It’s hand-sharpened and flexible so you can easily cut meat away from the bone. The soft rubber-grip handle is nice to hold onto and, because it’s non-slip, you’ll keep control of the blade even if it’s wet or greasy. 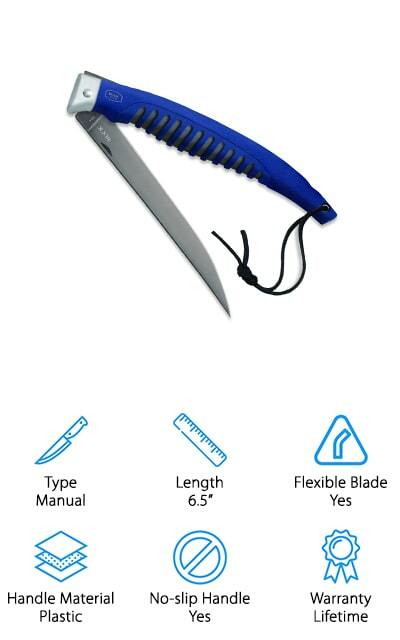 This knife also comes with a protective sheath you can attach to your belt so it’s great for fishing trips. Rada has been making knives in the USA since 1948 and strives to give their customers the best value for their money. This knife is just that and more and even comes with a lifetime guarantee that covers defects in material and workmanship. When you consider its name, it’s probably no surprise that the Rapala Fillet Superflex Knife is, well, super flexible. The hand ground stainless steel blade is extra thin which allows for precise control. And get this, it even has a PTFE non-stick coating. Everything slides right off to make filleting effortless and cleanup a snap. In addition to being an effective tool, this knife is also really good-looking. The hand-rubbed baked birch handle has a textured side grip and polished brass ferrule. 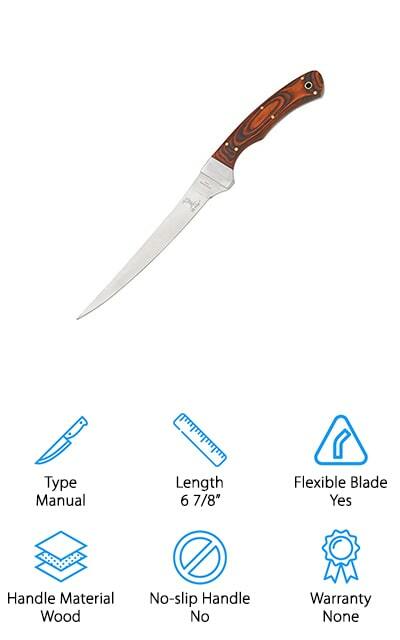 That’s not all, it comes with a tooled leather sheath with belt loop so you can easily take it with you on fishing trips and keep it close by. It’s made by Marttiin who have been in the knife business for over 50 years. It’s handmade and includes a 1-year warranty. Last but not least in our best fish filleting knife set review is the Elk Ridge ER-028. One of the first things you’ll notice about it is the laminated wood handle. It looks gorgeous and has a lanyard hole that makes it really convenient, too. The thin blade has a slight flex and is made of 440 stainless steel, which is some of the hardest material around. It also holds a nice edge that’s ideal for filleting. The 6 ⅞-inch long blade has a full tang, meaning the blade goes all the way down through that hand. That means it’s unlikely that the blade will break off and it adds a lot more stability and durability. It also includes a black nylon sheath that protects the blade when it’s not in use.